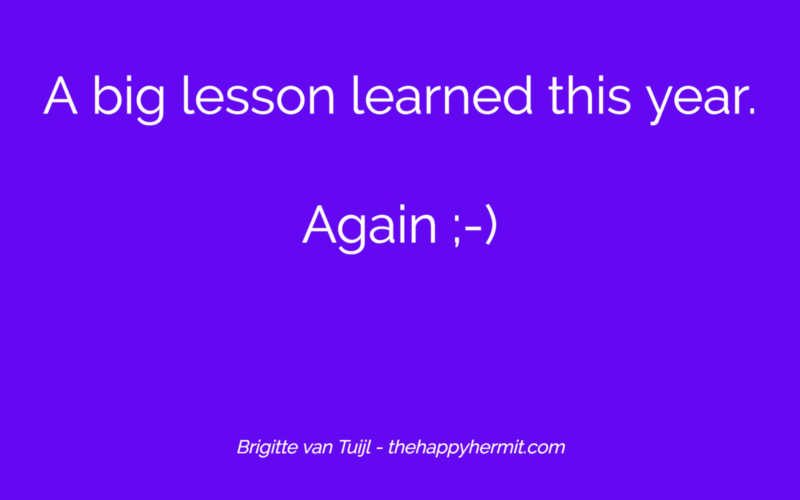 The lesson I learned – again! – this year, is this: when something feels like a no, say no. Someone asked to interview me. I read her email, and the VERY first answer that came up when I only opened it, and hadn’t even read a word she wrote, was NO. I KNOW this kind of NO. It’s not the ‘no’ born from fear of doing something outside of my comfort zone. It’s not the ‘no’ that comes from fear of not being capable enough. It’s not the ‘no’ that comes from fear of not having the time or the energy for it. It’s not the ‘no’ that comes from feeling unworthy or not measuring up to others who said ‘yes’ before me. It was the NO that comes from my intuition, my deepest, innate knowing of what decision is in my highest good and perfectly aligned with my soul’s path. It’s the ‘no’ I can blindly trust. Just like I can blindly trust the ‘yes’ that comes from this same source. 99,9% of the time, I honor whatever answer comes straight from my soul. I usually have no problem saying ‘no’. I have no problem saying ‘yes’ even when it scares me or makes me feel uncomfortable, either. And I have no problem following my intuition, even when for the life of me, I don’t understand the direction it gives me. Wasn’t this a great opportunity for more visibility? Wasn’t this an easy way to show up in front of more people, new people, who never heard of me before? Wasn’t this an easy way to potentially grow my reach, and my list, and spread my message? And I love speaking, and being interviewed. We did the interview, and it was super fun. A little crack showed up in the oh-but-this-is-a-great-opportunity-so-saying-no-is-self-sabotage-Van-Tuijl!-bubble. The arrangement we made eventually wasn’t honored. The date and what we agreed upon changed, and changed again, without any communication. Almost 7 months and several emails later, the interview STILL hasn’t aired, things shifted in my own business so the topic is no longer a perfect match to my business, and the freebie mentioned in the interview is no longer available. Which is no problem, because, as mentioned, the interview has not aired and I doubt it ever will. So, other than it being a really nice conversation, it was a waste of time. Time, effort, energy and, in the end, annoyance, I could have completely saved myself if only I’d honored my inner knowing and said ‘no’ when I felt it! Even though it seemed like a nice opportunity and my rational mind could only come up with reasons to say ‘yes’. Because, to be clear, this is on me. *I*created this: this is the direct result me ignoring my own inner knowing. Thankfully, I learned that lesson, again. (Because I cannot even count the times I felt the answer was ‘no’ and I still said yes, because my mind or fears talked me into saying ‘yes’. Or the other way around: to say ‘no’ when I felt that the answer was ‘yes’. My intuition was right. I wasted time, energy, and often even money by ignoring it. And I told myself that this was the LAST time I didn’t listen to it! Ah, well. Not beating myself up over it. I’ll dive into the underlying reasons for ignoring my soul, learn whatever lesson I haven’t received yet, and that’s that. And it’s not a big deal, by the way – just a friendly reminder to trust my soul and inner knowing deeply and blindly in WHATEVER it tells me. This morning, I received another interview request. From a super nice person, with her heart in the right place, and it wouldn’t cost a lot of time, and I like doing interviews…. But my soul said ‘no’. Ignoring your soul, your deepest truth, will ALWAYS send you on a detour. And you ALWAYS end up regretting it – a little or a lot, but regret all the same. P.S. : Not sure how to listen to your intuition or how to recognize it speaks to you? Not sure if it’s your intuition or your fear talking? You learn ALL about that in my online program Business Magic – how to co-create with the universe for more flow, growth, joy and profit in your business. You can ONLY get this program as a bonus with my online business program for women entrepreneurs: RISE. And healings that help dissolve your inner obstacles & blocks – healing that are done-for-you: all you have to do is relax & receive! This December, the topic is all about wrapping up 2017 to make space for an amazing 2018. You get a super powerful process to close this year, learn all it lessons, celebrate all its wins, make peace with whatever doesn’t sit right, and clear the slate for new beginnings. Read all about & sign up for it here. Please note: the December topic & materials are available until January 2 ONLY!